Red Funnel, the Isle of Wight ferry operator, has placed a £10 million order for a new ro-ro freight ferry from UK shipbuilder Cammell Laird. The new ship is designed to provide additional year-round freight capacity for Red Funnel’s Southampton-East Cowes route, which currently handles 53% of all freight movements across the Solent. Red Funnel is going to spend £3m on a major refurbishment of its ro-pax ferry RED EAGLE in the New Year. The work will be similar to the new look given to RED FALCON and RED OSPREY in 2014 and 2015. The main contract has been awarded to Trimline in Southampton, with aluminium fabrication work contracted to Wight Shipyard Ltd in East Cowes. The refit will be carried out in Southampton. Red Funnel should be allowed to bulldoze its existing terminal, nearby buildings and properties in Cowes, Isle of Wight. The Court’s decision came after an appeal against Isle of Wight Council refusal. Red Funnel wants to build a much-needed, modern ferry terminal. East-Cowes suffers from lack of space, with traffic congestion as a result. The first idea was to add houses, retail and a hotel, but Red Funnel had to scale down the plan. The company said a new terminal layout will be presented end of September. 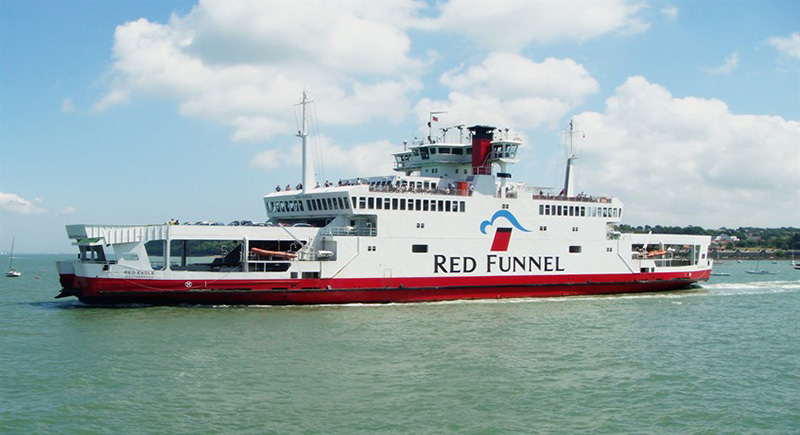 One month after cross-Solent ferry operator Red Funnel had been acquired by a consortium of UK and Canadian pension funds, a sister unit to RED JET 6 has been ordered. The high-speed, passenger-only ferry will also be built by Wight Shipyard on the Isle of Wight.